My daily commute to downtown Atlanta, by run or bike, takes me through several parks, one of which is a unit of the National Parks Service. Auburn Avenue is the heart of the Sweet Auburn Historic District, boasting many historic structrues and sites, not least of which is the Martin Luther King, Jr. National Historic Site. The park’s most-visited structure is MLK, Jr.’s boyhood home, in front of which you will see visitors from all over the world posing for photographs almost any time the sun is up. I am obsessed with National Parks, so it is a great pleasure to pass through or by here several times daily. And often as I pass, I see Doug Coyle. 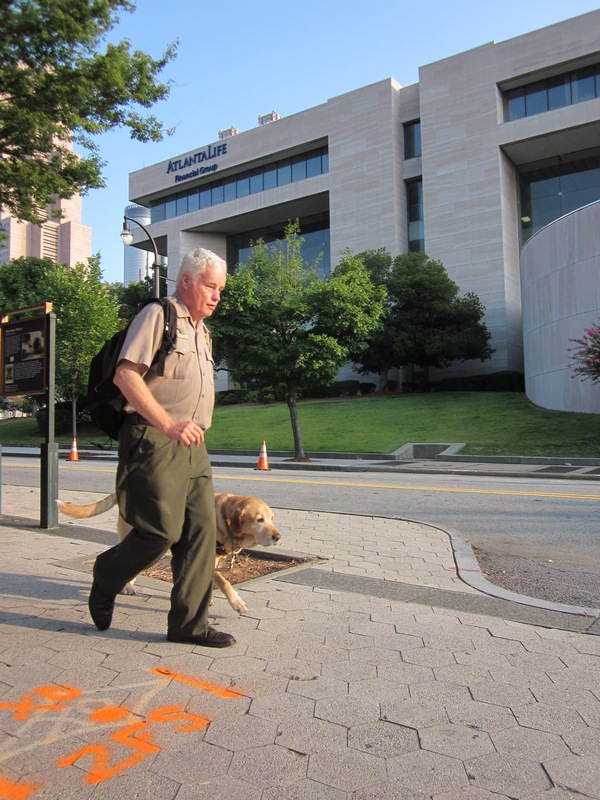 Doug Coyle and his service dog commuting to work.